Although the college experience is largely about academics, those formative years of higher education are also a prime time to jump-start your professional development. If you make smart moves while you're still an undergraduate, you'll have an easier experience finding a job after graduation. Up your networking game during college with these strategies. Your first stop should be your college's career services office. Don't end your college career without taking advantage of the assistance you can get through your school - from resume help to alumni networking, your campus career services is a great way to jump-start your job search, from the first year to the last. Your career office is there to help, and best of all, the services available through it are all already paid for by your tuition. When it comes to classes relevant to your major, don't just sit in the back with your eyes half-closed and only one ear open. Make yourself known to the professor: sit up front, ask questions, and attend the professor's office hours. Not only will this likely help your grade, but it will also lead to establishing a positive relationship. Professors often have tons of connections, from colleagues in the field to former students, making them a valuable resource during your job search later on. Plus, you'll be grateful for the relationship if you have to ask a professor for a reference letter. Don't limit yourself to professors that you have classes with. If there's somebody in your department who you think might be able to offer career advice or help you land an internship or a job, you have nothing to lose by shooting him or her a friendly email and asking to arrange a time to meet casually and chat about your career path. Once you've made those connections, keep them. LinkedIn is a great way to stay in touch with professional contacts, so ensure you make an active effort to keep your profile updated. Setting up a ​personal website is another good addition to your online presence. Although professors and professionals are valuable resources for advice, people who are a few years out of school are helpful, too. After all, job searching has changed a lot even in the past decade, so talking to people who are fresh in the work world can bring a whole new perspective to your job search. In addition, LinkedIn has a tool which users can use to access employment information for alumni from their college. If your college offers alumni networking events, make an effort to attend - and be serious about it. Dress the part, and carry a few resumes with you too, because you never know who you might encounter. Keep your eye out for profession-specific events or job fairs in your area, too. 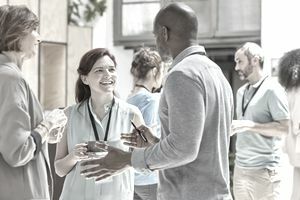 Here's how to make the most out of college alumni networking events, and how to start a conversation with the people you meet. Attend as many other professional networking events as you have time for. An internship gets your foot in the door—and even if it doesn't end in a job at that specific company, it can connect you with other opportunities, as well as serving as a reference source in the future. So, even if you are unpaid, don't just treat your internship as a resume filler. Take it seriously, do your best, and you'll thank yourself after graduation. Want to connect with someone at your internship, a professor, or even someone in your field that you admire? Request an informational interview to find out about what they do and how they got there. This can even take place via email or on the phone. Either way, establishing contacts - and maintaining them - creates valuable connections when it comes time to launch your career. Do you dream of working for a specific company? Make a point to follow them on social media sites like Twitter, Facebook, Google+, LinkedIn, Instagram, and Pinterest. Not only does this imply your interest in a future opportunity, but it's a good way to keep track of job openings. For example, some employers have a specific Twitter account for job opportunities, and many companies—small and large—post about when they're hiring on their social media pages.